1. Why did you decide to start your own business? I had worked for many different employers since I was 13 years old, so I’d experienced my fair share of bad bosses and lousy managers. There was also this intense curiosity to test my abilities whilst still young along with my growing love of the accounting industry which gave me the kick into gear I needed. Before starting Tall Books, I worked for MYOB. I started as a tech support rep with the idea it would be a temporary job. I ended up loving it and moved into head office, eventually working as a senior partner manager in the bookkeeper’s division. Starting my own business – Tall Books – was the best decision of my life to date. Don’t think I could ever go back to employment! 2. What did you study and why did you choose Monarch? 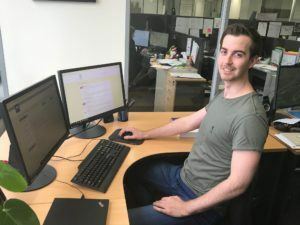 During my time at MYOB I realised I had a thirst for more knowledge in bookkeeping and accounting, I thought I’d do a Certificate IV in Bookkeeping to see whether I would maintain interest after completing a qualification in the field. Working full-time I needed flexibility and hated the idea of another set of classroom tutorials. I researched many online options and Monarch Institute came out on top. 3. How did you find the experience? Was it difficult returning to study? I could not get enough of bookkeeping! Every night I’d come home from work and just pour myself into the studies! The knowledge that it could help me launch a future business drove me to complete it very quickly. Through Monarch Institute, I realised my learning style was very suited to online study and so it was no surprise I received immense satisfaction out of the study, compared with my past experiences going into classrooms on set days each week. 4. What did you enjoy most about studying with Monarch? I really enjoyed the flexibility and the course content. Being able to work at my own pace, be it fast or slow was a great benefit, I also liked that I could email occasional questions I had to support and know that a qualified educator on the other end would come back to me quickly with the required answers. 5. Tell us about your nomination for the Young Leaders in Finance Awards 2018. I work so hard on my business, Tall Books is my passion and to me, every day helping small businesses succeed is very rewarding. When I received the email to say I was nominated it was a really nice pat on the back for the work to date. Very humbled by it all! 6. What is your biggest small business challenge? Being a workaholic I tend to work nights a lot and really enjoy checking off every task I have on my never-ending to-do list. Delegating and stepping away have been a big challenge for me. In 2018 I have planned more holidays and have progressively delegated more work to my staff member to assist with growth and work/life balance. To see Samuel speaking about his experience studying with Monarch Institute, click here.